The author visited all sites personally. The book is written in first person and includes personal adventures of the author. For each cave or mine you are provided with the site’s location, contact information, facilities, nearby attractions and a portion of its history. 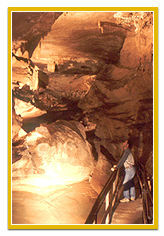 The first book event for Show Caves of the Ozarks will be Saturday, May 5, 2012 at Bridal Cave, Camdenton, MO. Bruce Raisch will do a book signing, tell stories and even lead cave tours. The event starts at noon. All five of his published titles will be available at the book signing. The art production and layout for Show Caves of the Ozarks is complete and it has been sent off for print production. There are a fair number of differences when comparing this book with my past works. First, most of the photography in this book is in color. The past books all had black and white photography. Another difference is for once not all the photography is my own. This time it is a blend of sources, including family photos. It’s easy to pick out the old family shots; they are the only ones in the book that are black and white. Other sources included various government agencies and the management of the various caves within the book. Caving is not a subject that is new to me although this is the first time I’ve written about it. Also it is the first book I’ve written entirely on the Ozarks. It was nice to write about home. The book is laid out for easy use as a travel guide. Each cave has its own section in which the reader is provided with the place’s location, history, contact information, facilities, tour information, other activities and more. The sections are grouped by state with the Missouri portion of the book having 16 show caves and the Arkansas portion have 9 show caves. At the back of the book there is a bonus portion. Here you have two additional sections. One is for the Bonne Terre tour mine and the other is for a restaurant in Richland, MO that’s built inside a cave. They were both unique and fun. Then there’s the second book, Underground Treasures of the Black Hills. It is still in the art and layout production. This other book also has show caves and even more tour mines. It also has dinosaur museums and a mammoth dig amongst the sites within its pages. As usual the books were done in first person adventure style writing. The wildlife adventures include bat and cougar encounters. Along the way you see a couple of photos and read a story or two that are, let’s say unusual. For example both books have show caves that are for sale.